Different Games Conference is an event on diversity and inclusivity in games, which strives to amplify the creative and critical voices of marginalized participants in games culture. Geared towards accessibility and radical inclusivity, our annual volunteer-led conference welcomes panels, workshops and playable games from presenters of all professional backgrounds and levels of expertise. Our programming is diverse and interdisciplinary with a focus on featuring emerging voices and representing identities and perspectives not typically supported by the commercial industry. 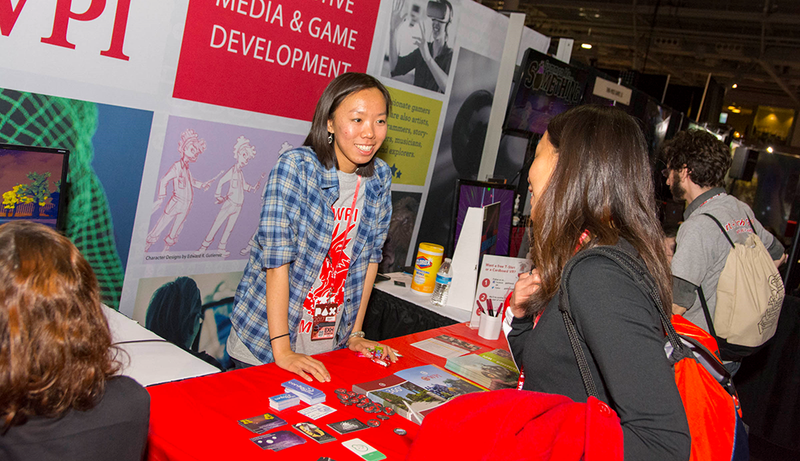 Students and faculty members from Worcester Polytechnic Institute’s (WPI) Interactive Media & Game Development (IMGD) program will participate in PAX East, an annual tradeshow held in different parts of the world for gamers, showcasing video games designed by WPI students. Alphafest is a chance for the entire IMGD community to hang out together, show off project work in progress, conduct playtesting, gather feedback and eat pizza! All MQPs and grad projects due for completion in April 2019 are expected to exhibit at this event. Cool projects created for coursework or ISPs, as well as personal work, are also welcome. Game Jams are events, hosted WPI’s Game Development Club Developers, where game development skills are learned and pushed to the limit. During a Game Jam, students are tasked with making a full game in a limited period of time, usually 48 hours. It seems a bit daunting, but WPI's Game Jams are fun and friendly--students on different teams will routinely offer help to others, and most WPI Game Jams aren't competitive in the slightest. Anyone of any skill level is allowed to participate, and a lot of freshmen make their first game at a Game Jam. Besides hosting our own Game Jams, WPI also collaborates with other organizations and colleges to join in on the fun. Every year WPI participates in Global Game Jam, a Game Jam that takes place at the same time all around the world. Additionally, WPI opens its doors to Becker College students who wish to join in our Jams, and sometimes our students will travel to Becker College itself just down the road to make games in their Jams as well. The MassDiGI Game Challenge is a one-of-a-kind pitch competition and event that helps aspiring game developers launch new games. The seventh annual 2018 Game Challenge will be held on March 2 & 3 at the brand new MassDiGI New Ventures Center on the campus of Becker College in Worcester, MA. As always it will feature industry mentors, veteran judges and keynotes and great prizes – you don’t want to miss it!